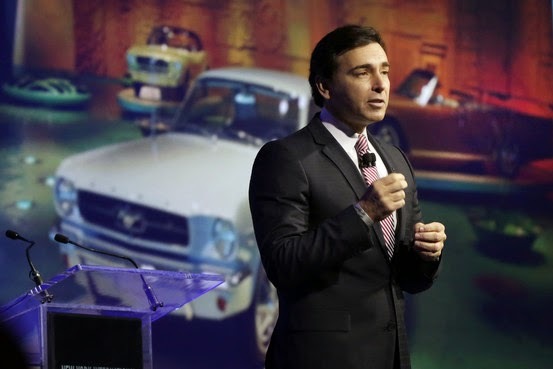 Ford Motor Company has announced that Mark Fields will become the company's next CEO replacing Alan Mulally. Presumably Henry Ford is rolling in his grave since Fields, a Jewish man whose family changed the last name from Finkelman in a previous generation, will be running the company the notorious anti-Semite founded in June 1903. When Bill Ford, the executive chairman and great-grandson of Henry Ford, announced the appointment of Fields as COO it was obvious to all that he would be named to the CEO post in 2014 upon Mulally's retirement. According to Crain's Detroit, Alan Mulally, 68, will step down before the end of 2014 and be "succeeded by Fields, 53, now chief operating officer, according to the people, who asked not to be identified revealing internal plans. The Dearborn-based company may announce the moves as soon as May 1, the people said." While Alan Mulally’s compensation at Ford in 2013 rose 11 percent to $23.2 million, according to the company's proxy statement, Fields received total compensation of $10.17 million last year, which is up 15 percent from his $8.85 million compensation in 2012. Mulally’s total payout since coming to Ford in 2006 will be more than $300 million. The howl of cost strikes again. Henry Ford saw the jews for what they are. Unfortunately not enough people listened to him. Mr. Anonymous had better stay anonymous because the Mossad would like to "interview" him. How come "anonymous" didn't leave his name?